The leadership of the U.S. military is really hoping for a Hollywood ending when it comes to satellite. At least, that is the impression left from three days of government and military content at ISCe 2008, the California satellite show that ended June 12. Quite a few films have been based on the ancient idea of selling your soul to the devil in order to gain extraordinary capabilities in life. There are two ways the story can end. In the more realistic one, the hero misspends his life, meets his inevitable downfall, and receives, shall we say, a warm welcome in the afterlife. In the Hollywood ending, the hero redeems himself through some act of selfless love, gets his soul back and heads to heaven. The Army, Air Force, Navy and Marines have indeed gained extraordinary capabilities from satellite. Excellent presentations by officers including DISA�s Brig. Gen. Jennifer Naper, US Army Col. Patrick Rayermann, Maj. Gen. James B. Armor USAF (Ret.) and Rear Admiral John R. Hines, Jr., Deputy Commander of the U.S. 3rd Fleet, made clear how net-centric the US Armed Forces have become. It was a remarkably short time ago that voice, supplemented by data at dial-up modem speeds, was how the people at the sharp end of conflict exchanged information, controlled operations and reported on results. Today, armed conflict is all about remotely piloted vehicles, satellite-based, force-tracking systems, shared situational awareness, and data downloads to the warfighter. 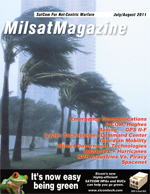 With the Wideband Global Satcom (WGS) satellites now entering service, one speaker reported, the Navy looks forward to soon being able to deliver 8 Mbps to ships at sea for the broad range of digital applications that today�s military requires, from data networking to meteorological reports to crew morale applications. At that point in the presentation, a question arose from the audience. Eight megabits per second? Isn�t that kind of, well, unimpressive for the primary link to a ship carrying the population of a small town? Rear Admiral Hines explained that getting that capacity to the sailors, rather than just to the ship, means rewiring vessels, which is an immense job requiring years fleet-wide. Eight megabits is only the first step; speed and capacity are slated to rise with the launch of the full WGS constellation. However, after two days of listening to my colleagues in uniform, I thought that other factors were also at work. First, the rate of changes reflects the innate conservatism of people who need systems to work when people are trying to kill them. When the Internet connection goes down in my office, I may be upset but I am not rendered suddenly blind to an incoming threat. But the deeper reason that the military�s most advanced satcom system is behind the curve, compared with civilian systems, goes to the heart of the unease the Armed Forces have about the devil�s bargain they have made. Unlike civilian communications, military communications have to be satellite-centric. Neither ships at sea, nor motorized battalions, go to war dragging optical fiber behind them. In addition, satellites are vulnerable. Jamming them, as another officer pointed out, is child�s play for a person with the right equipment and knowledge. Blowing them out of low-earth orbit, as the Chinese recently demonstrated, is a task within the scope of several nations. Even GEO systems are presumably vulnerable, though no one wanted to go into detail on that. So, the military is becoming highly dependent on communication systems that are highly vulnerable to attack by nations and non-state adversaries. This vulnerability was the theme of all the speeches by the most senior officers at ISCe 2008. For entirely justifiable reasons, this concern has slowed adoption of technologies that would make the military even more dependent on communications satellites. No one would discuss in a public forum what they are doing about the problem, but they certainly want the commercial industry to understand their concerns and collaborate on finding answers. In a luncheon keynote, Lt. Gen. William Shelton, Commander of the Air Force�s Joint Functional Component Command for Space, raised another issue much on the minds of the U.S. military. He contrasted China�s January 2007 downing of one of its own satellites with the U.S. Navy�s destruction of a spy satellite in February 2008. The Chinese, he noted, destroyed the satellite in low earth orbit, a particularly crowded piece of space, and the debris cloud they created is mostly still in orbit, creating a significant hazard to other spacecraft. They also did it without pre-announcement, for reasons that the Chinese government has yet to make clear. In contrast, the Navy announced the event in advance, provided a justification, and carefully plotted the impact so as to drive most of the debris on trajectories that would take it into the atmosphere, where it has harmlessly burned to ash. In addition to making it clear who the good guys are, Gen. Shelton�s speech was about the thousands of pieces of debris already in orbit and the very real possibility that allowing warfare to extend into Earth�s orbit could render space unusable for hundreds of years. Of all the threats I heard about during ISCe 2008, that one gave me shivers. It would take so little to bring it about: just a cascade of fear and misunderstanding, bolstered by disregard for consequences. All very familiar human failings. The threat can only be addressed in the way that the nuclear powers dealt with mutually assured destruction during the Cold War. Whatever the tensions and geopolitical maneuvering, we have to make sure that everybody understands the simple truth: in some games, the only winning move is not to play. About the author Robert Bell is Executive Director of the World Teleport Association. Since 1985, WTA (www.worldteleport.org) has been the only trade association focusing on the business of satellite communications from the ground up. He can be reached at rbell@worldteleport.org.